If you want high-quality images, but speed is your primary concern, this Canon multifunction printer is right for you. If you're in the market for a home office or enterprise printer that can handle anything you throw at it, the Sharp MX-C301W printer is a 72.8 lb. unit that handles copying, printing, scanning, and faxing, all with a footprint of just 17" (w) x 22½" (d) x 18½" (h) (prices vary). Samsung also produces two quality models, the C2670FW ($699.99, £445, AU$852) and the Multifunction Xpress C460FW ($470, £310, AU$575) both provide everything you'll need to satisfy your workers and their printing needs. If neither of these units tickles your fancy, but you want similar capabilities, a new contender has emerged. The Canon ImageClass MF820Cdn ($1299, US only) boasts the brawn of Samsung's models with the print quality of the Sharp device. 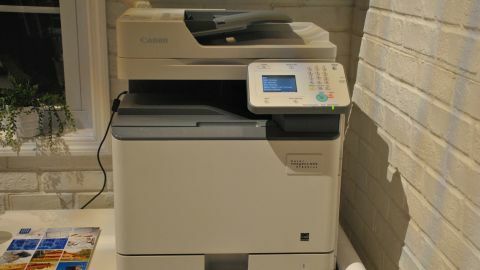 This is a top-of-the-line, comprehensive and competent print/scan/copy/fax machine that demands your consideration. At 94.8 pounds and two feet tall, the MF820Cdn is a beast. If you're looking for a compact device, you're in the wrong place. However, what this printer lacks in elegance, it more than makes up for in performance. It boasts a duty cycle of more than 88,000 pages per month that produces 600 x 600 DPI prints created from four toner bottles and four drums of yellow, magenta, cyan and black ink. You can load 550 sheets into the main tray and 550 sheets into each of the three additional optional trays. You can also load 100 sheets into a multi-purpose tray if you need even more capacity. The printer comes with a USB port, air pressurized toner bottles and drums and a waste toner system that is meant to protect against leakage and spills (more on this later). You'll conduct most of your business on a 3.5-inch LCD touchscreen that is intuitive and simple-to-use (theoretically - more on this later as well). It is designed to connect with office ethernet networks and file-transfer systems, as well as Apple AirPrint and Mopria Printer Service mobile applications. Unfortunately, all you'll be able to print are documents from envelope to legal size, so forget about loading your avant garde photo projects onto this bad boy. The MF820Cdn is super quick, producing 36 color pages per minute and an incredibly impressive 8.96-second single page print. The copier replicates documents in 6 seconds and the fax machine can distribute 36 pages in one minute for color and black text. When using a behemoth of a printer like this one, you typically expect it to spit out dull prints that are good enough for board meetings but too boring to put behind a frame. I wouldn't compare the quality of the MF820Cdn's prints to the Pixma line of photo printers - however, I was impressed with its prints. The reds, blacks and blues produced on this machine are incredibly bright and bold, with a depth you don't typically see on mass-duty printers. Security is a major concern for anyone printing employee documents and financials. This printer features a tool that enables you to send a document to the printer with an accompanying passcode, so that you can print from across the office, go to the device at your leisure, and then command the print be made once you've entered the passcode. No more sprinting from across the trading floor so that you can grab your 401k spreadsheet before your buddy scoops it up. Although the air-pressurized toner bottles are designed to prevent leakage, when I opened the machine and checked out each bottle individually I noticed minor spillage at the tips of two of the four bottles. It wasn't enough to alarm me, but I do wonder if minor spillage turns to major flooding after heavy-duty usage. This device can print from a ton of awesome places. If you work at a place that commands a $1299 printer, you're likely connected to an ethernet network, a mobile app and maybe even a hard line. However, unlike most of the other Canon printers I've tested (even really low-end machines) this one doesn't offer any cloud printing capabilities. As I said, this isn't a major issue if you're hooked up to these other connections, but it seems like an avoidable omission. I don't like Canon's touchscreens. The buttons are always too close together, which makes it impossible to scroll. For example: Canon crams three or four options onto the 3.5-inch screen, rather that providing space between each option, so when you attempt to scroll you inevitably click on one of the options. This happens along the entire spectrum of Canon's lineup (I tested a Pixma and had the same issue). This machine does almost everything you'll want an office printer to do. It prints fast. It prints clear. You can't go wrong with it. It does have a few minor flaws, but no one has created a perfect printer. This comes pretty close. However, if you're interested in photo printing or non-traditional printing formats, you'll likely want to head elsewhere, as this model is specifically designed for standard office use.